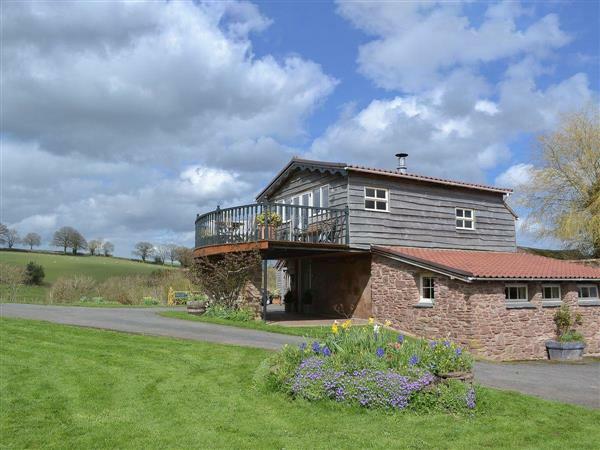 The spacious balcony of this tastefully converted attached barn is perfect for enjoying the far reaching views and catches the sun most of the day. The living/dining room/kitchen is on the first floor, to take maximum advantage of the outlook, with windows on three sides giving a light and airy feel. The holiday cottage is located in the grounds of a delightful old country house, which enjoys use of a heated swimming pool in summer, the owner of which, is happy to show off her Gipsy Moth aeroplane and vintage car. Conveniently situated between the Wye Valley and Malvern Hills, there are numerous attractions to interest the visitor at any time of year. Shop and pub 2 miles, restaurant 3 miles. Ground floor: 2 bedrooms: 1 double, 1 twin, both with beams. Bathroom with shower over bath and toilet. First floor: Living room with French doors/dining room/kitchen with wooden floor. Woodburner in living room included. Oil central heating, electric, bed linen and towels included. CD. Electric cooker. Microwave. Washing machine. Dish washer. Freezer. Balcony with furniture. Portable Barbeque. Parking (1 car). Use of swimming pool (9.75m x 4.9m).Natural water supply from borehole. Holidays at Bugatti House run from Friday to Friday. For a better idea of where Bugatti House is, you can see Bugatti House on the map below. Bugatti House is in Herefordshire; should you be on the lookout for a special offer, you can find all the special offers in Herefordshire. It's always worth checking to see what is on offer at the moment. Do you want to holiday near Bugatti House (W3888), you can see other cottages within 25 miles of Bugatti House; have a look to find your perfect holiday location.